Is a small outgrowth of bone under the nail plate usually affecting the great toe, caused by either a single traumatic incident e.g being stood on by a football stud or repetitive trauma as the great toe is continually stubbing the end of a shoe. An extremely painful condition, as the boney outgrowth becomes larger, it causes the nail plate to detach from the nail bed forcing the skin over the end of the toe to become red and to thin. Temporary relief can be given by using protective padding or altering footwear. Surgical excision is always inevitable and the most satisfactory treatment. 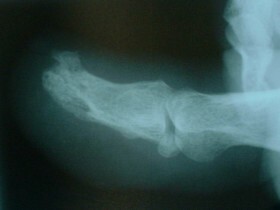 Surgery for a Subungual exostosis is performed regularly at The Yorkshire Foot Hospital.